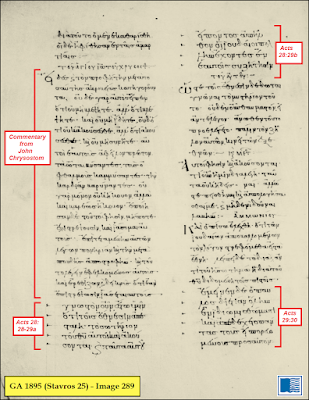 GA 1350: Hagios Stavros 46 – Four Gospels (1100’s, 1300’s) This was catalogued as an Evangelion, but it is a continuous-text manuscript of the four Gospels. Beginning of Matthew. Beginning of Mark. Beginning of Luke. Beginning of John. Pericope adulterae (follows John 7:52). 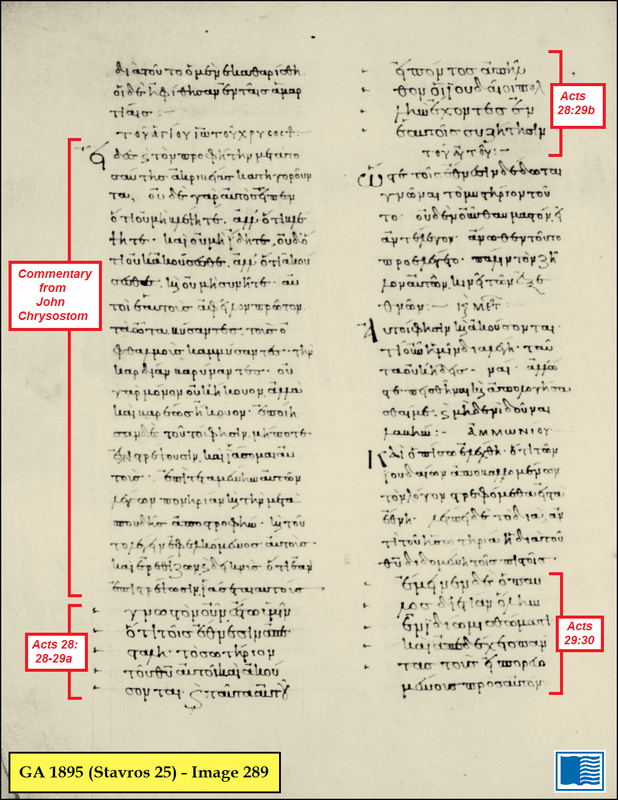 GA 1895: Hagios Stavros 25 – Acts and General Epistles, with Commentary (800’s/900’s) The commentary includes excerpts from the writings of Athanasius, John Chrysostom, Cyril of Alexandria, Basil of Caesarea, and others. Scripture-texts, interspersed with the commentary, are indented and accompanied by diple-marks (>) in the margin. Beginning of James. GA 1896: Hagios Stavros 37 – Praxapostolos (without Galatians) (1300’s/1400’s) Beginning of James. GA 1897: Hagios Stavros 57 – Praxapostolos (c. 1200) Beginning of James. Hagios Stavros 67 – Apostolos (1000’s) An interesting copy with sporadic notes in the margin. Hagios Stavros 96 – Psalter (800’s) This manuscript, written in a sloping uncial script, has an abundance of marginalia. Some of these manuscripts have not received much attention from researchers. A few research-papers might be just waiting to happen as a result of the availability of these images.